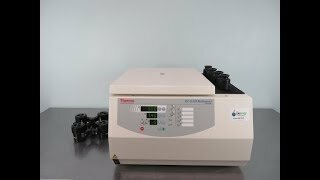 The Thermo IEC CL31R refrigerated centrifuge provides flexible speeds and reliable separation for routine biology, cell culturing and research labs. This high capacity centrifuge can run a wide variety of rotors and buckets, without sacrificing bench space. The IEC CL31R uses a brushless induction motor, for minimal maintenance, and CFC refrigerant to protect temperature sensitive samples. This benchtop centrifuge is microprocessor controlled, with simple intuitive controls with 5 acceleration and breaking profiles, access up to 5 user defined programs, set times from 30 second to 99 minutes, or continuous operation, and set temperatures between -9° - 40°C. Changing rotors in this refrigerated centrifuge has a quick system, with autolock rotor exchange, allowing you to swap quickly, or clean with ease. This Thermo IEC CL31R Refrigerated Centrifuge has been fully inspected, including temperature, speed and structure and is performing without issue. All of our lab equipment comes backed with our standard warranty. Should you have any questions, please don't hesitate to contact us.